Most carousel enthusiasts know that the Philadelphia Toboggan Company numbered each of their carousels in the sequence of when it was manufactured. Our now famous Kit Carson County Carousel, PTC#6, was originally constructed in 1905 for Elitch Gardens in Denver and then sold to Kit Carson County in 1928. Also completed in 1905 were numbers 6,7,8 and 9. So, why was PTC#51 which would replace #6 for Elitch Gardens totally out of sequence? Other machines constructed or refurbished (but not necessarily finished) in 1928 were numbered 81R, 83, 84 and 85. Numbers 50, 52, 53 and 54 were all constructed in 1920. Yes, PTC could count but their numbering was based on the year of the initial construction of the carousel’s enclosure, rather than the year that the actual carousel was completed. 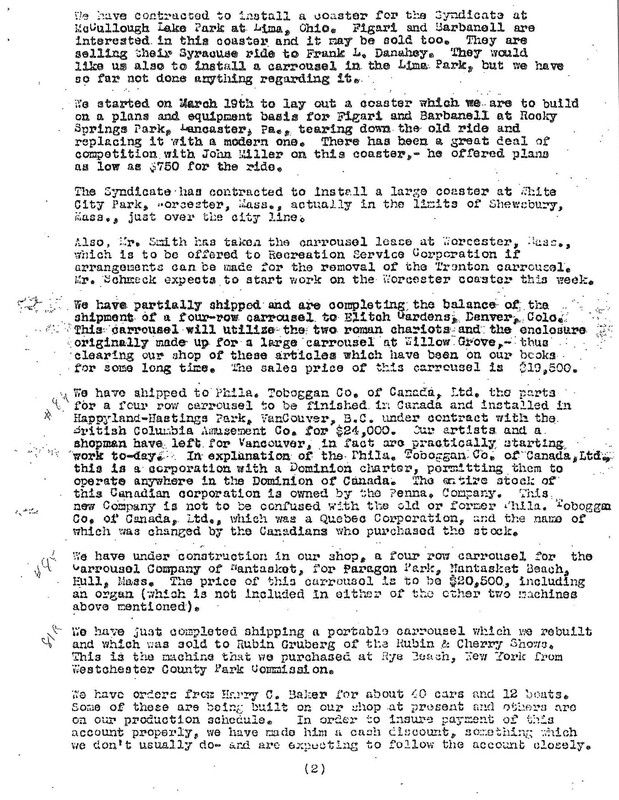 As reported in the minutes from the PTC Board Meeting held April 3, 1928, PTC#51 and its two spectacular roman chariots were originally intended for Willow Grove, an amusement park in Pennsylvania. One of the chariots features an ornately carved Lady Liberty…perhaps to celebrate the end of World War I in 1918. Willow Grove’s loss, Elitch Garden’s gain!! Willow Grove operated from 1896 through 1975. Its closure was announced in April 1976 and the park sat vacant until the land was cleared for a large shopping mall which opened in 1982. According to Philadelphia Toboggan Company records PTC#11 operated at Willow grove from 1906 through 1922. Why the order placed in 1920 for #51 was cancelled is unknown.